* Bradford No.1 AA, River Swale, Maundby, N. Yorks. Sun, 30. Pete Vickerman (Bradford No.1) 6-0-0, dace, stick float and maggot, peg 28; Ian Bradley (Bradford No.1) 4-14-0; Andy Barker (Bradford No.1) 4-0-0; Andy Whalley (Bradford No.1) 2-10-0. * Clubman semi-final, Daiwa Hallcroft, Retford, Notts. Sat, 30, Moat outer. Lee Hewison (MAP Leegem) 115-12-0, 20 carp to 8 lb on pole and meat long, peg 53; Mark Cordall (Hallcroft) 73-0-0; Shane Pimperton (Plough AC) 69-12-0; I Marshall (Subfish) 58-12-0; Alan Tait (Retford) 54-13-0. * Daiwa Hallcroft, Retford, Notts. Sun, 37, Moat Lake. Steve Barraclough (Frenzee) 231-2-0, carp to double figures on pole and meat shallow, peg 10 outer; Daz Oldham (Maltby) 148-12-0; Andy Sellars (Bankside Tackle) 123-12-0; Steve Corbett (Mexborough) 118-12-0; Brian Sullivan (Maltby) 106-13-0; Steve Shepherd (Worksop) 101-12-0. * Happy League, New Junction Canal, Sykehouse to Hacienda, S. Yorks. Sun, 88. John Cragg (Clay Lane) 10 Kg 950 gr, skimmers, feeder and maggot, peg 247; Les Billups (Worksop) 9.700; Glen Lawrence (Garbolino Ossett) 8.900; Ian Starbuck (Sensas Walton) 8.050; Ian Littlewood (Sensas North) 6.900; Mick Lodge (Garbolino Ossett) 6.050. * Mirfield, Aire and Calder Navigation, Whitley to Heck, W. Yorks. Sat, 45. Keith Ellis (Pontefract) 4-10-0, three skimmers, feeder and maggot, peg 54; Pete Dawson (Mirfield) 3-2-0; Paul Bennett (Tackle 2U) 2-0-0; Andy Bradley (Mirfield) 1-12-0; Dave Wilkinson (Barnsley) 1-8-0; Dave Pollitt (Mirfield) 1-6-0. Sun, 51, River Calder, Mirfield to Dewsbury. 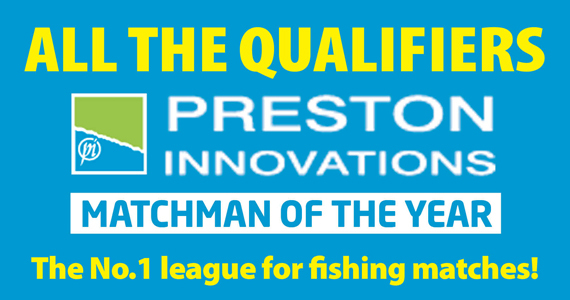 Carl Stevenson (Mirfield) 11-3-0, perch, waggler and worm, Ship Inn weir; Martyn Highe (Mirfield) 11-0-0; Dave Wilkinson (Barnsley) 10-7-0; Steve Clegg (Saints) 10-3-0; Andy Bradley (Mirfield) 9-12-0. * Northern Super League, Oaks Fishery, Sessay, N. Yorks. Sun, 64. 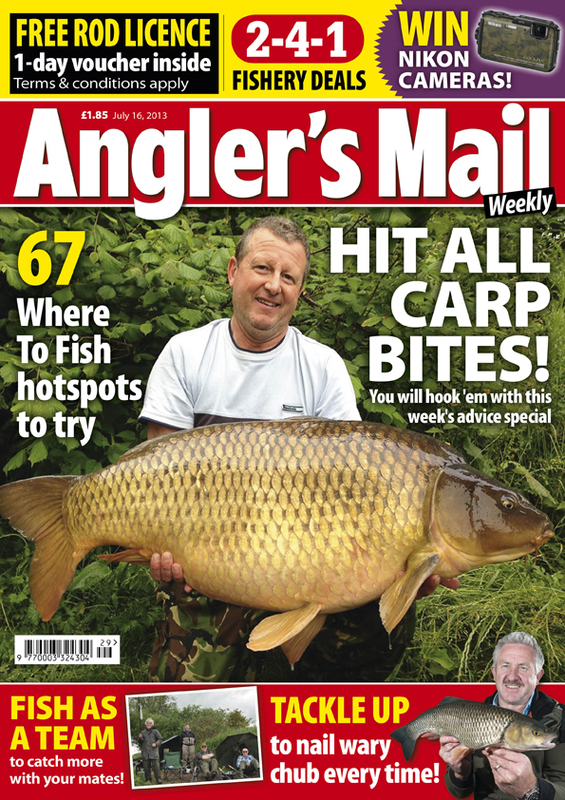 Dave Smiddy (Maver Newman Scotts) 68-4-0, carp, pellet, 14m, Cedar Lake peg 5; Andy Simpson (Browning Quaker) 67-0-0; Dave Watson (North Ormesby Institute) 66-13-0; Tom Trenholme (Browning Quaker) 62-8-0; Peter Rambow junior (North Ormesby Institute) 56-12-0. * Oaks Fishery, Sessay. N. Yorks. Sat, 34, Cedar Lake. Chris Kendall (Middy) 115-3-0, carp to 6 lb, pellet, peg 55; Dean Smith (Matrix Bait-Tech) 107-2-0; Chris Hall (Oaks) 106-12-0; Mark Wainwright (Garbolino Ossett) 102-11-0; Rob Minikin (Sonubaits) 96-12-0. Sun, 32, Ash, Beech and Sycamore lakes. Dean Smith (Matrix Bait-Tech) 146-0-0, carp to 5 lb, pellet, Beech 2; Ben Fisk (Middy) 138-4-0; Chris Kendall (Middy) 134-7-0; Bert Poole (Oaks) 126-7-0; Chris Hall (Oaks) 126-6-0. * Ripon, River Ure, Ripon, N. Yorks. Sun, 43. Steve Taylor (RSPS) 35-8-0, ten chub, waggler and bread, peg 14; Steve Beckwith (Leeds) 18-4-0; Rob Pickles (KL Tackle) 7-2-0; Kevin Weighell (DH Angling) 6-12-0; Kevin Miller (Aireborough) 6-10-0; Terry Morgan (Aireborough) 4-12-0. * Tidal Trent Teams, R.Trent, Laughterton, North & South Clifton, Lincs. Sun, 56. Steve Whitfield (Steel City) 15-15-0, skimmers, crumb feeder, worm and caster, peg 2 North Clifton; Geoff Margetts (Rotherham) 9-11-0; Steve Gilbert (Lincoln Match Squad) 8-11-0; Ian Turner (Worksop) 8-4-0; Paul Moutrey (Scunthorpe) 7-3-0; Roger Woolhouse (Garbolino Harrisons Lincs County) 5-6-0. Teams: Lincoln 50 Shades Of Grey 16; Lincs County OAP 17. League: Lincs County OAP 4; Leegem Angling 5. Bank End, Finningley. Sun, 26. 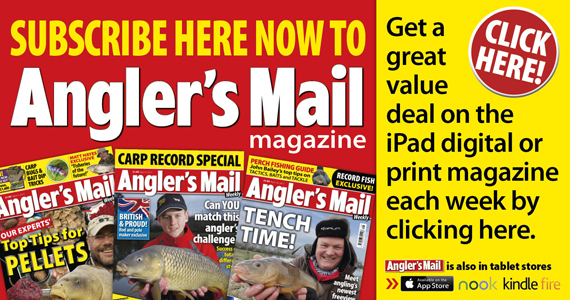 Dean Foster (Kerfoots Tackle) 175-3-0, carp on waggler and pellet, peg 31; Dave Porritt (Doncaster) 153-6-0; Trev Jordan (Bank End) 151-14-0; Len Squire (R & R Sports) 138-7-0; Graham Clark (Bank End) 129-13-0; Steve Rylance (Bank End) 102-4-0. Barnburgh, Doncaster. Tues, 18. Over-50s. Paul Brunyee (Castleford) 86-0-0, F1s on pole and pellet; J. Simms (Barnburgh) 73-0-0; Les Peace (Barnburgh) 58-0-0. Fri pm. Mark Sixsmith (Barnburgh) 91-0-0, F1s on pole and pellet; Ryan Law (Barnburgh) 79-8-0; Les Peace (Barnburgh) 77-15-0. Sun, 20. Middle pond. Rod Pilkington (Barnburgh) 127-0-0, F1s on pole and pellet; Mick Owen (Barnburgh) 125-4-0; Les Peace (Barnburgh) and Paul Jenkinson (Barnburgh) both 118-0-0. Daiwa Hallcroft, Retford, Notts. Mon, 20. Veterans. Reg Turner (Retford) 138-10-0, carp to 7 lb on pole and meat shallow, peg 23 Reed; Ken Pacey (Gainsborough) 101-12-0; Chris Line (Retford) 98-8-0; Roger Holmes (Notts AA) 81-12-0; Nick Wood (Hallcroft) 77-2-0. Tues pm, 28.Bridge. Jamie Masson (Marukyu) 95-2-0, carp to double figures on pole and waggler with pellet, peg 21 outer; Nigel Shipman (Hallcroft) 64-2-0; Rich Teigh (Handsworth) 42-14-0; R Goldwater (Hallcroft) 40-12-0; Daz Oldham (Maltby) 40-6-0. Fire Service National. Wed, (26 Teams). Gavin Leversidge (Marukyu) 176-13-0, carp to 9 lb on 14m pole with meat and pellet shallow, peg 90 Moat outer; Andy Hampson (FSSAA) 100-14-0; Rob Goldwater (FSSAA) 97-6-0; F Holt (FSSAA) 90-10-0; C Prince (FSSAA) 90-0-0. Thurs, 38. Veterans. Moat. Bri Sullivan (Maltby) 156-4-0, carp on waggler shallow with pellet, peg 10 outer; Mark Cordall (Retford) 122-14-0; Ian Donaldson (Notts AA) 97-7-0; Ken Pacey (Gainsborough) 85-12-0; K. Walters (Retford) 83-13-0. Sat, 20. Moat island. Andy Sellars (Bankside Tackle) 180-12-0, 25 carp to 10 lb, waggler shallow with meat and pellet, peg 33; John Kelly (Doncaster) 151-2-0; Andy Lakey (Worksop) 132-12-0. Dynamite Baits/Scunthorpe & DAA, Tidal Trent, South Clifton, Lincs. Thurs, 28. Nigel Grindle (Grimsby) 17-12-0, bream and skimmers, tip fished worm and red maggot over worm and caster, peg 46; Malc Firmstone (Whisby AS) 10-13-0; Steve Drage (Bawtry) 7-10-0; Roly Moses (Brigg) 4-12-0; Nigel Broadley (Brigg) 4-9-0. Ferryboat Farm, Conisborough, S. Yorks. Thurs, 8. Dave Cutts (Rotherham) 38-0-0, carp and skimmers, pole and feeder; Tony Brown (Ferryboat Farm) 29-0-0. Sun, 10. Ian Douglas (Ferryboat Farm) 40-0-0, carp and skimmers, pole and feeder; Derek Jackson (Rotherham) 34-0-0; Chris Adshead (Ferryboat Farm) 22-8-0. Kiveton Hall, Nr Sheffield. Sun, 19. Bottom lake. Mick Todd (Kiveton) 127-6-0, carp on dog biscuit, peg 72; Danny Myers (Kiveton) 97-0-0; John Forster (Kiveton) 69-2-0; Pete Morley (Kiveton) 50-8-0; Les Kemp (Kiveton) 45-12-0; Alan Barker (Garbolino Elton) 39-0-0. Langwith Lakes, York. Sun, 21, Anya and Emma’s. Francis Williamson (Knottingley) 131-2-0, carp, corn on top kit, Anya peg 9; Ian Taylor (Cats and Dogs) 117-8-0; Tom Bainbridge (Acomb) 115-6-0; Lee Bramham (Otley) 92-8-0. Lincoln Gary Thompson Memorial, River Trent, Laughterton and North Clifton. Sun, 23. John Urruty (Radcliffe) 18-2-0, barbel, feeder and caster, Laughterton peg 32; Steve Gilbert (Lincoln) 12-8-0; Alan Houlton (Garbolino Harrisons Lincs County) 11-4-0. Oaks, Sessay, N. Yorks. Tues, 12. Chris Hall (Oaks) 83-3-0, carp to 6 lb, meat at 14m, Cedar Lake peg 8; Chris Kendall (Middy) 77-6-0; Luke Hawksworth (Daiwa Cleveland Angling) 53-8-0. Wed, 19. Mark Dickinson (Westlands AC) 169-0-0, carp to 2 lb, pellet, Sycamore 21; Chris Kendall (Middy) 164-8-0; Rob Minikin (Sonubaits) 163-15-0. Thurs, 19. Rob Minikin (Sonubaits) 138-6-0, carp, pellet, Sycamore 3; Chris Kendall (Middy) 129-9-0; Luke Hawksworth (Daiwa Cleveland Angling) 119-1-0. Sykehouse Fishery, Doncaster. Wed, 14. Russ Campbell (Stainforth Angling Centre) 153-6-0, carp on pellet waggler, peg 27; Gavin Millward (Stainforth Angling Centre) 151-15-0; Jamie Knott (Stainforth Angling Centre) 144-6-0. Thurs eve, 16. Mark Price (Stainforth Angling Centre) 71-9-0, carp on pellet waggler, peg 11; Daz Hall (Thorne) 69-4-0; Jamie Snedker (Stainforth Angling Centre) 65-7-0. Sun, 23. Dave Bomber (Sykehouse) 59-6-0, carp on pole and meat, peg 1; Mick Glaister (Stainforth Angling Centre) 58-12-0; Mark Hopkins (Stainforth Angling Centre) 58-11-0. Thornaby, River Tees, Croft. Sun, 28. Steve Chantry (Darlington) 13-10-0, dace, waggler and maggot, peg 50; Mick Broadley (Thornaby) 13-5-0; Mick Clitheroe (Darlington) 11-2-0; Bobby Trees (Darlington) 9-12-0. Thornhill, Calder and Hebble Canal, Dewsbury. Sat, 14. Chris Storey (Thornhill) 6-6-0, two bream, caster, 14m, peg 71; Stuart Campbell (Matrix Halifax) 4-9-0; Pete Wilson (Tri-Cast Calder) 4-5-0. Viking Fishery, Pollington. Sat, 14. Hawk Pond. Garth Sykes (Viking) 106-11-0, carp on pole and pellet, peg 16; Chris Watson (Ackworth) 84-11-0; Phil Morris (Knottingley) 49-10-0; Colin Ramsgill (Ackworth) 46-8-0. Woodhouse Grange, Doncaster. Wed, 11. Heron. Steve Clegg (Woodhouse Grange) 95-12-0, carp on pole and pellet, peg 29; Bud Buckler (Woodhouse Grange) 93-8-0; Tony Clegg (Woodhouse Grange) 64-0-0. Thurs, 12. Kingfisher. John Pearson (Kingfisher Angling) 153-8-0, carp on pole and pellet, peg 7; Mick Rodgerson (Woodhouse Grange) 111-0-0; John Dudley (Woodhouse Grange) 92-4-0. Sat, 11. Bernie Larder (Woodhouse Grange) 128-0-0, carp, pole and pellet, peg 7; Pete Gosney (Woodhouse Grange) 70-12-0; Steve Cross (Team Majestic) 51-12-0. Sun, 14. Heron. Andy Bailey (Daiwa Dons) 104-0-0, carp on pole and pellet, peg 8; Steve Cross (Team Majestic) 56-10-0; Bill Snow (Woodhouse Grange) 50-0-0.